Fleece Performance Air Intake System 07-19 Ram HD 6.7L Diesel Fleece Performance Air Intake 07-09 Dodge Ram 6.7L Cummins, Fleece FPE-MANTAKE-67 Air Intake System, Dodge Ram Fleece Intake, Dodge Ram Cold Air Intake, Dodge Ram Intake, Dodge Ram Intake System, Dodge Ram Cold Air Intake System, Dodge Ram Fleece Intake, [Fleece FPE-MANTAKE-67 Intake Kit] - $250.95 : 3rd Strike Performance, Your Source for Late Model MOPAR Performance Parts and Accessories! If you've modified your Cummins with an ATS cast or 2nd Gen T4 Steed Speed manifold with a downward-angled outlet flange and a Borg-Warner S400 turbo, then you'll need these Fleece Performance ManTake air intake kits. They're designed to be used with 5 in. compressor cover inlets on 2003-16 Cummins. 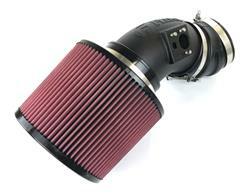 The included 8-ply filter is cleanable, has a round inlet for improved airflow, and is ISO 5011 filtration-tested. Black Wrinkle plastic tube. Red Cotton gauze filter.